Kuwait –24 October 2018: As a positive contributor to Kuwait’s society, Burgan Bank has forged an eighteen month partnership ending March 2020 with en.v, an organization dedicated to fostering social development and civic engagement in the Middle East. The new strategic collaboration aims to ameliorate the spread of knowledge through innovative platforms and initiatives, and drive the sustainability of local communities. To kick-start the partnership, Burgan Bank is sponsoring the first event, titled ‘Awaken Festival’ to enhance the civil society’s capacity and capabilities in Kuwait. The festival will be held during the period of 15-17 November 2018 at Dar al-Athar al-Islamiyyah in Yarmouk Cultural Centre. The three-day Festival intends to support civil society organizations become more effective in addressing societal challenges, unite diverse community members to unleash the potential of everyone in Kuwait, ultimately contributing to a better future. Through its various workshops, activities, and events, the Festival will bring together people from different backgrounds to think creatively about pressing social issues in Kuwait. 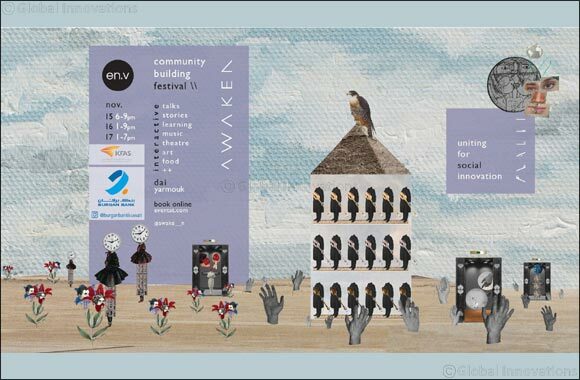 Using mediums like music, poetry, spoken word, acting and more, the AWAKEN Festival will feature forward-thinking collaborations, encourage meaningful discussions and explore new ways for people to understand their role within society. The civil society sector in Kuwait has been expanding in recent years through higher participation of youth through various creative initiatives. To further develop this crucial sector, AWAKEN completed an initial mapping and needs assessment, to be followed by a three-year strategic process that centers around society collaboration, community and private sector engagement. En.v has developed and implemented a number of programs over the past eight years, empowering individuals and enabling civil society organizations, educators, and youth to address local and regional challenges in innovative ways through the provision of training, funding and networking opportunities. The long term partnership of Burgan Bank with en.v will enable a results-oriented program that will further enhance the role and impact of the civil society sector in Kuwait. Falling in line with its community program, ‘ENGAGE’ – Together to be the change, Burgan Bank sheds light on important aspects affecting every segment of the society by promoting social welfare through educational, cultural, social and health initiatives. Burgan Bank’s approach to 'ENGAGE' begins with a vital principle that as a Kuwaiti financial institution, its conduct and policies should be aligned with the needs and interests of the Kuwaiti society.